Tumor necrosis factor α (TNFα) is an important pro-inflammatory cytokine expressed primarily on the surface of macrophages, but it can also be produced by other immune cells, smooth muscle cells, and fibroblasts. It mediates a diverse range of biologic effects but is particularly important in the acute response to inflammation. Indeed, it has been implicated in the pathogenesis of many inflammatory and autoimmune diseases, including rheumatoid arthritis, inflammatory bowel disease, Crohn's disease and psoriasis1. 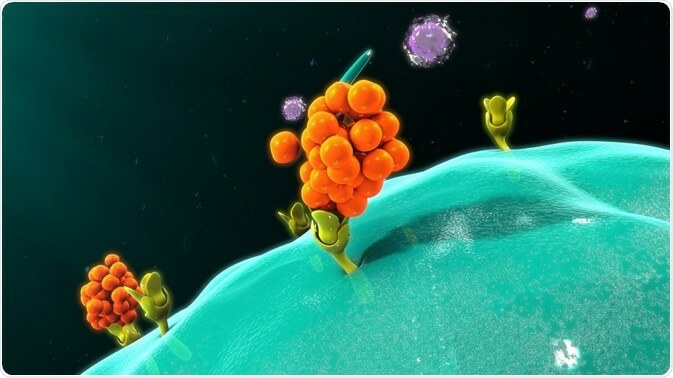 The development of biologic anti-TNFα drugs, such as infliximab, adalimumab, etanercept, and certolizumab pegol, was a breakthrough in the treatment of many chronic inflammatory diseases, especially in cases refractory to conventional treatments. The lowering of TNFα levels using these anti-TNFα agents significantly decreases chronic pathologic inflammatory responses in inflammatory diseases, such as Crohn’s disease, rheumatoid arthritis and psoriasis. Although the biologics represent a valuable treatment option, they are associated with some major safety concerns. Their use can increase the risk of serious opportunistic infections, including tuberculosis, and skin cancer2. In an attempt to provide the efficacy of anti-TNFα activity with an improved safety profile, there has been much research into the possibility of achieving TNFα inhibition using small molecules. If the activity of TNFα could be modulated using small molecules, this may increase the therapeutic safety window with regard to increased infection risk. The majority of TNFα is membrane-bound but it also occurs in a soluble form. It is a trimer comprising three identical monomers. This trimer is the active form that binds the TNFα receptors. However, immunoenzymatic assays have shown that TNFα undergoes changes between this active trimer and an inactive monomer3. The switch between the two forms is concentration-dependent; the trimer appears transiently in local areas of high concentration. Further research indicated that inhibitors of TNFα inactivate the cytokine by inducing a conformational change that results in dissociation of the active trimer to the inactive monomers4. It then became a priority to further investigate the structure of TNFα to determine whether there was an inactive form of the trimer conformation that could be stabilized by a small molecule. In this way the trimer could neither bind its target receptor to exert its inflammatory effects nor release monomers that could recombine into an active trimer. The culmination of such research was the recent determination of the structural conformation of the trimer just before it dissociates into inactive monomers5. Double electron-electron resonance (DEER) has successfully been used to determine the monomer orientation and conformational changes of the aspartate transporter, another trimeric protein6. DEER is a technique designed for investigating the orientation of the component monomers within a trimer. Labeling just a single residue allows three inter-monomer distances to be determined. The peak formation reflects the distances between each monomer; a sharp, single peak indicates identical distances between the spin label on each monomer and movement of the monomers relative to each other gives rise to additional peaks. Analysis of the peaks provides the percentage of trimers of different conformations at a given time. This methodology was thus chosen for the study of TNFα. The DEER analysis was performed using a Bruker BioSpin E580 spectrometer and a Bruker SpinJet arbitrary waveform generator. A Bruker EN 5107D2 dielectric TE01δ resonator was used for all pulses in Q-band ELDOR. A Bruker BioSpin SHQE-W TE011-mode cylindrical resonator was employed for the continuous-wave electron paramagnetic resonance. DEER was used in conjunction with site-directed spin labeling to study natural conformations of the human TNFα trimer5. The study reported the identification of a previously unreported, predeoligomerization conformation of the TNFα trimer in which one of the monomers is rotated and tilted outward. It is this conformational change that results in the dissociation of the trimer into its constituent inactive monomers. Interestingly, that movement of one monomer relative to the others distorts a receptor binding side so that the TNFα can no longer bind to the TNFα receptors, whereby rendering the trimer inactive. It is thought that this movement may represent natural conformational sampling of the human TNFα. The discovery of this new structure presents a novel angle for the development of potential anti-TNF treatments. It is hoped that a small molecule can be identified that will stabilize the trimer in this distorted, inactive configuration to reduce TNFα activity. Should such a small molecule be found, it may be able to provide anti-TNF efficacy with a lower risk of serious infection and cancer than the biologics. Shim H. One target, different effects: a comparison of distinct therapeutic antibodies against the same targets. Exp Mol Med. 2011;43(10):539–549. Ding T and Deighton C. Complications of Anti-TNF Therapies. Future Rheumatol. 2007;2(6):587‑597. Corti A,et al. 1992. Oligomeric tumour necrosis factor a slowly converts into inactive forms at bioactive levels. Biochem. J. 1992;284:905–910. Alzani R, et al. Mechanism of suramin-induced deoligomerization of tumor necrosis factor a. Biochemistry. 1995. 34:6344–6350. Carrington B, et al. Natural Conformational Sampling of Human TNFα Visualized by Double Electron-Electron Resonance. Biophysical Journal 2017;113:371–380. Hänelt I, et al. Conformational heterogeneity of the aspartate transporter Glt(Ph). Nat. Struct. Mol. Biol. 2013;20:210–214.